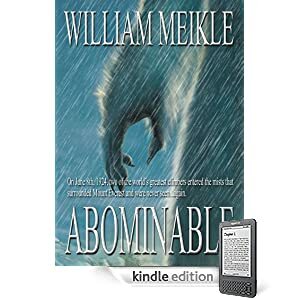 On a different note, I’ve just purchased and read William Meikle’s short story “Abominable” which is the tale of the 1924 expedition to Mount Everest by George Mallory and Andrew Irvine. I’m no great reviewer, so let me get that out of the way right away. I can appreciate a good short story, however, as I know that one only has so many pages to work the magic. And Meikle conjures up a believable tale of admiration, survival, and monsterish-ness. In “Abominable,” Meikle writes in the first person, utilizing three different voices. I was smiling after the first few pages. As far as I could tell (and my memory of the climb is a little, um, fudgy), he keeps his story based in the known facts of Mallory’s and Irvine’s climb, and extrapolates what might have happened—or dare I write—did happen (see—he’s got me believing) on Everest’s snowy heights. The tale is told in a 1920’s prose, and gives a short but believable look into the characters of Mallory and Irvine. When all was said and done, I felt a little sad at Irvine’s stark acceptance of his fate, and his attempt to leave an account of what befell him and Mallory. The little details were well done, and I particularly liked how William made mention of items that have fueled speculation over whether or not the pair of mountaineers actually reached the top of Everest (okay, right, so I wikipedied the details ). Those little drops of realism are like pearls, and they made the story shine.